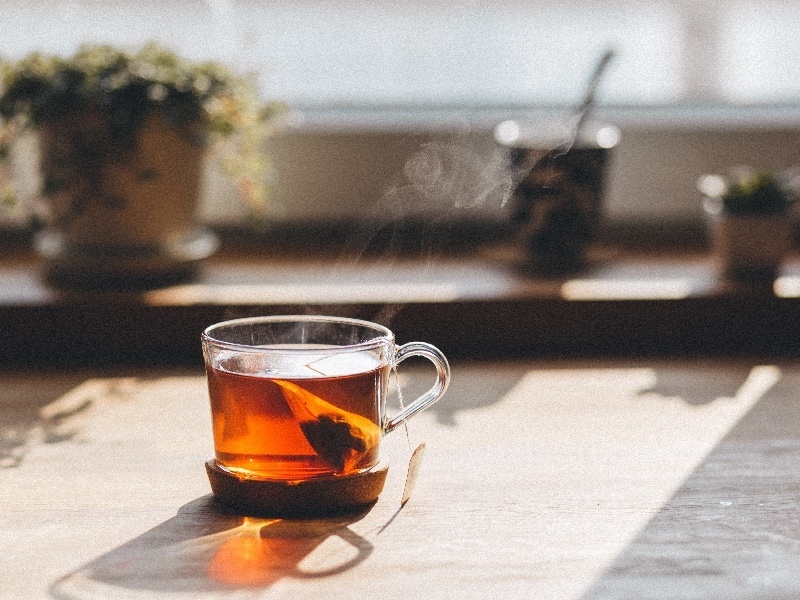 Most teas are cooling in energy, allowing them to clear energetic heat and mildly dry dampness. Green tea, or Lu Cha, is one such herb as is Oolong tea, or Wu Long Cha. Oolong is simply fermented Green tea leaves; that is, both of these teas come from the same plant. Both of these 2 types of foliage are heat-clearing herbs that purge fire, often seen as internal heat. However, the fermentation process that creates Oolong tends to smooth out the more harsh properties of the Green tea. Green tea is much colder than Oolong and this comes through in the flavor; where Oolong has a mild sweetening, woody flavor, Green tea has a more popping bitterness. Both teas, however, are useful for stomach disorders and removing dampness in the form of grease and fat from the body; Oolong has the added benefit of mildly reviving the shen. While many people feel that adding anything to a cup of tea is an unfathomable adulteration of the tea, I rather enjoy experimenting with my tea. Over the years, I've come up with some recipes of my own (some based on popular blends) that I'd like to share. While everyone's tastes will differ, it is important to balance the amounts of honey and lemon in such a way that they combine with the tea and create a balanced taste. Adjust to your taste and play with it a bit. This can be a nice refreshing drink, especially as it cools. The green tea is cold; the lemon has a cool and sour property that boasts bountiful levels of health assets. The warm honey balances the cold items out from both an energetic as well as a culinary perspective. This concoction doesn't quite taste the same with other teas. I've tried it with Pu Erh, Oolong, White tea, as well as the less appealing store-bought teas, but none of them taste just right...Loose leaf Lu Cha is the way to go here. The old classic Chai is such a fantastic drink that's been adopted by just about every coffee shop across the USA. The frothy spiciness with just a hint of sweetness is a winner in the minds of millions. Chai tea is usually composed of several warming spicy herbs, such as Cinnamon bark (Rou Gui), Star Anise (Da Hui Xiang), Pepper (Hu Jiao), and importantly, Clove buds (Ding Xiang). Some recipes also provide undertones as a result of the addition of vanilla, orange peel, nutmeg, and even pumpkin flavoring and spice. Some years ago, one of my martial arts students brought me back a bag of Green Tea with Chai from Hawaii, and I've been experimenting with mixes ever since. My favorite thus far is this Oolong Chai, although Pu Erh works nicely as well. First we will start by grinding a couple grams of Ding Xiang and tossing them in our cooking apparatus. Now, here's my little Chai secret: Rather than go the same route as usual and use Rou Gui, we are going to use Gui Zhi. I don't know why but Gui Zhi, in my opinion, tastes drastically better than Rou Gui when made in Chai. Grind your Ding Xiang and Gui Zhi, and add to this just the smallest amount of Da Hui Xiang. Lastly, I often cook my teas with a few pieces of Fang Feng. Do NOT add the Oolong tea yet. Take all of these items (minus the tea) and cook them in about 2 cups of water for about 15 minutes–just long enough to extract some goodness, but not so long that we destroy any essential oils or make the decoction too strong. At this point, you should have about 1 cup of liquid left. Now add about 1 cup of milk, a dash of vanilla, and allow the mixture to nearly reach a boil. As this happens, the milk will begin to froth up and expand. Remove the mixture from heat and pour the liquid over your tea, straining off the herbal matter. Steep for as long as your personal preference prefers. I *always* add honey but its not a requirement. Honey is incredibly nutrient-rich and helps pull out the flavors of the other items. As you sip this tea on a cool Autumn evening, you'll notice that it has a soothing feeling and tends to numb the throat just a tad. Ding Xiang contains Eugenol and other essential oils which create a very powerful anesthetic herb and you can tell as you drink the tea. The cooling, exterior releasing action is often used to clear exterior heat, but it's also very useful for sore throat. A nice cup of Bo He tea using only 3 grams of Bo He is a delightfully refreshing cup of goodness. It can soothe the throat and relieve hot flashes, but most importantly, it tastes very good. Bai Dou Kou, or white Cardamom, is a very interesting little fruit with a strong pungent flavor and aroma, which one might guess is a clue to its ability to dissolve dampness and regulate Qi. It has a strong popping flavor which I find provides interesting tones when used in small quantities with the right type of mix. It has been used in the past with Chai teas as discussed above and provides a moving element to the strongly heating herbs used in Chai. When using Bai Dou Kou, remember to use small quantities and thoroughly crush the seed pods. Additionally, only steep this herb or add towards the end, as it is composed of several volatile oils that can be destroyed with cooking. Mei Gui Hua are the small buds of wild rose, of which many hundreds of species are well known. Mei Gui Hua is a great regulating herb and has a warm sweetness with bitter undertones when steeped as tea. While Mei Gui Hua is perhaps a rare tea ingredient today, in past times, it was used not just as tea, but also for a variety of culinary uses. As such, its use is great either in addition to other tea-based ingredients or by itself. * Fang Feng: As discussed earlier, this herb is versatile for fighting Wind of all kinds–it has a minimal impact on the flavor of a strongly brewed tea. * Huang Qi: Good to tonify the Wei Qi and commonly shows up with Fang Feng (and Bai Zhu) in Jade Windscreen. Also has minimal impact on flavor. * Gou Qi Zi: Used in some gourmet bagged teas, Gou Qi Zi produces a nice sweet flavor that can replace the presence of honey or other sweeteners. It is a food-grade Yin tonic with fantastic antioxidant properties. * Jiao Gu Lan: While the flavor is not terribly appetizing, Jiao Gu Lan is a quick and cheap replacement to Ren Shen that can be made as a tea, or added to other items to balance the flavor. There are many tea purists out there who may feel that some of these additions to their tea is an adulteration of an already perfect drink. However, there is a lot that can be had from various teas, in terms of health, flavor, and therapeutic utility. Go ahead and do some experimentation; you may just find a hidden combination that you never thought could exist!